I thought it would be fitting that my first ink review should be the first bottle of ink I ever purchased. 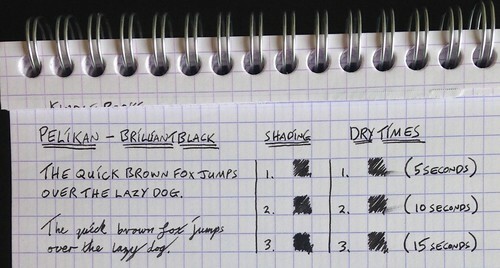 The black is nice and dark and stays a good consistent depth of black while writing. There was a small number of occasions were some of my letters did look a tad bit lighter in shade, almost more like a pale black but overall a nice deep shade of black. The shading test did show that the more I went up in the shading scale the darker the black did get. Overall the drying times were pretty impressive. There wasn’t much difference between 5 and 10 seconds but at 15 there was no smudging at all. I do think this ink would be suitable for even left handed writers. I would love to hear from and lefty’s out there if you have used this ink, good or bad experiences. This ink is a breeze to clean out of a fountain pen. Only took a couple of flushes before it was running clear. As with my fountain pens I am a fan of the colour black. For my first ink purchase I found this to be a great starting point in my ink journey. 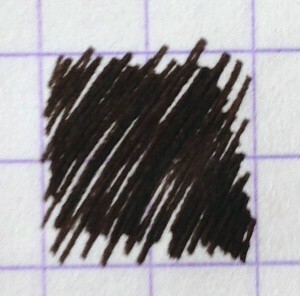 The ink is a really nice deep shade of black and the drying times make it a great everyday ink. I have been using this as my everyday ink for 11 months now.